We offer a variety of choices for advent candles. 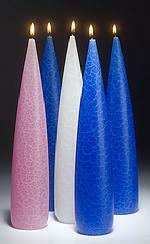 You can chose blue or purple as the primary color with a pink candle or all 4 candles in your primary color. Some choose to add a fifth white candle. Our favorite set is in the 14" size. We also offer advent sets in a 10" height. All prices include ground shipping to the 48 states. Add a 14" Single White. Add a 10" Single White.